I realize that these scones might not look like much. There’s no shiny glaze, no bright fruits dotting the surface, but scrolling past these unassuming little lumps of baked dough would be a mistake. They’re the most breakfast-y of scones I’ve ever known. And though I’ve never tried hot oatmeal – there’s just something about the texture that turns me off – I imagine that anyone raised on the stuff will find a familiar cozy feeling with each nibble. 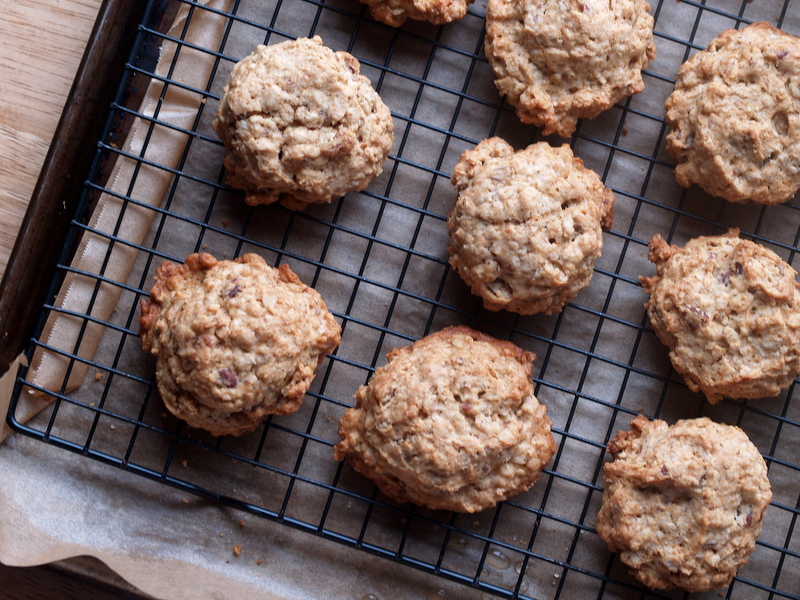 The scones are grounded in a healthy dose of oats, nearly as much oat as flour, which gives them heft without density. They get their sweetness from maple syrup (it’s in season right now, so go out and grab a gallon of fresh grade B), so they taste and smell of nectar and nature. Toasted pecans lend a buttery crunch. And then there’s butter and cream to round it all out. Also, they take just a few minutes to throw together. In the time it takes to pre-heat your oven (mind you, mine takes ten minutes), you’ll have toasted and chopped the pecans, rubbed butter into flour, whisked maple into cream, mixed wet ingredients into dry, and scooped up these unremarkable looking lumps of dough. But bake these little guys up, and you’ll believe me when I say they’re all that. No bag of chips necessary. Adapted from Flour, but just barely. I skipped the raisins and glaze in the original recipe, and made much smaller scones which reduced the baking time from 40 minutes to 25. Make sure to toast the pecans – I scatter them on a cookie sheet and pop them in the oven while it’s heating up. As for the maple syrup, buy grade B which is darker and mapley-er than grade A. 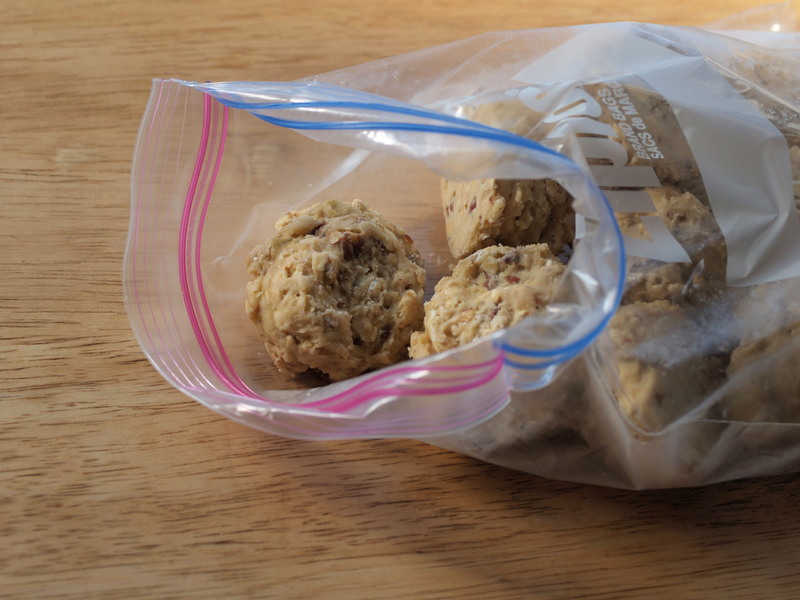 You can also freeze the unbaked scones: scoop out the dough, freeze them on a baking sheet, and wrap them well in plastic. Then bake them straight from the freezer, adding about 5 minutes to the baking time. Toast. Scatter the pecans on a baking sheet and toast in the oven while it’s preheating. This should take less than 10 minutes – the pecans are done when they color slightly and you can smell their nuttiness. Once the pecans have cooled, chop them. Mix. 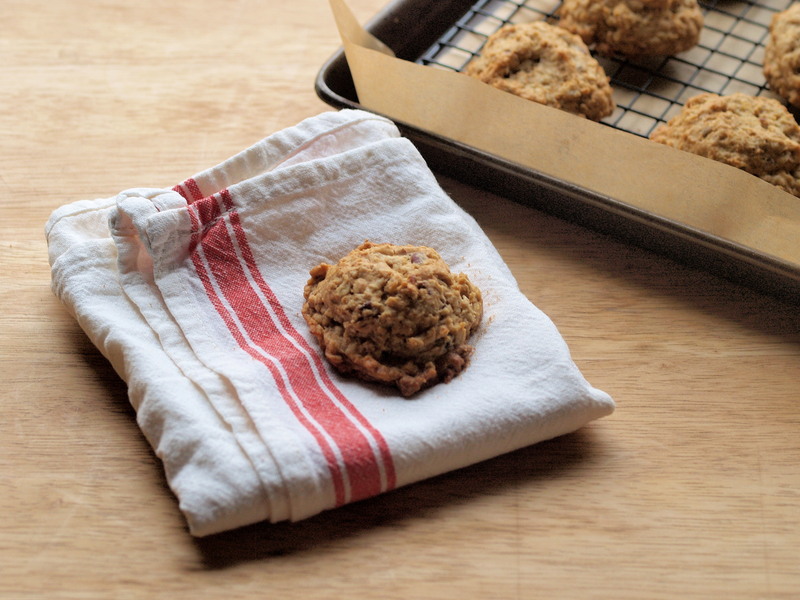 Using a stand mixer with a paddle attachment, mix together the flour, oats, baking powder, and baking soda on low-speed for 10 to 15 seconds, or until just combined. Cut the cold butter into small cubes and scatter into the bowl. Mix on low-speed for about 30 seconds on low-speed, or until the butter is somewhat broken down and grape-sized pieces are still visible. (Or just dig your hands in and rub the butter into the flour with your fingers). Whisk. In a small bowl, whisk together the cream, maple syrup, and egg until thoroughly mixed. Mix again. On low speed, pour the cream mixture into the flour-butter mixture and mix for 20-30 seconds or just until the dough comes together. It will be fairly wet and you will still be able to see some pieces of butter. Stir in the cooled chopped pecans. Scoop. Line a baking sheet with parchment paper. Scoop dough – about 3 tablespoons per scone – onto the parchment. I used a tablespoon-sized scooper and mounded one heaping tablespoon on top of another heaping tablespoon. A regular tablespoon and a gentle nudge with your finger will work just fine here as well. At this point, I slipped half of the scooped dough onto a baking sheet and into the freezer, eventually packing them up in a few plastic bags. Bake. Bake for 25 minutes, or until the scones are golden brown on top. If you’re taking the dough straight from the freezer, baking will take about 30 minutes. Store. The scones are best on the day they’re baked. However, if you can’t eat every last one, wrap up the leftovers and freeze them. I love them straight from the freezer; otherwise they thaw in just a few minutes.